If you, like me, have ever had the experience of standing perplexed between the Men's and Women's clothing sections of a retail store and wondering which side of the aisle to shop on, a solution to your problems has finally arrived. 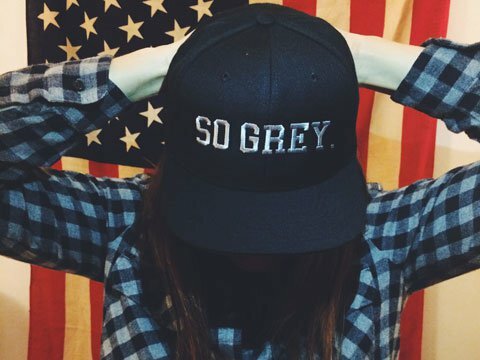 Greyscale Goods, a brand new company founded by visionary, fashion maven, and all-around badass Sara Medd, just reached its funding goal on Kickstarter (the fundraising ends tonight at midnight, so if you feel like checking out the page or throwing them additional support, go for it!). The company will be the first of its kind to source the market for quality clothing that is perfect for a masculine-of-center or even tomboy femme style, curate a personalized look for you, and ship it right to your door. I was lucky enough to sit down with Sara and talk about her new company and the amazing goals she has to revolutionize the clothing industry. 1. So first of all, what exactly is Greyscale Goods and what makes it unique as a company? How does it work? The short answer: We will bring together all of your favorite gender-neutral brands under one roof, style them into outfits for you, then send them to your doorstep. You send us back anything you don’t like/doesn’t fit, along with feedback. Like any relationship, communication will help us get to know each other better and improve our next attempt! The shopping platform falls into a fairly new shopping category on the market known as “subcom” or subscription commerce, also known as “discovery commerce”. In the same vein as BirchBox, Stitch Fix, Trunk Club, and various other retailers who fall into this genre, Greyscale Goods will not have a traditional e-commerce landing site. Instead, customers will answer a series of questions that build into a profile, which then gives in-house stylists the information needed to determine which of our styles will best suit that customer. But unlike any other company that currently exists on the market, Greyscale Goods will specialize in androgynous, tomboy, dapper, and classic styles. 2. What personally inspired you to create this company? Before Greyscale Goods was even a thought, the need for a retailer that offers more selection in gender-neutral clothing was very clear. I found myself referring many styling clients to boutique online retailers, most of whom are also startups trying to answer these frequent questions for customers. The risks involved in ordering online from startup boutique retailers were often too much hassle for the customers (inconvenient return policies, requirement to order custom fitting shirts with no returns, high pricing), and often the offerings were very small and niche. And customers that do not live near a metropolitan area have very limited access to stores that offer anything but extremely polarized men’s and women’s clothing departments. As a result, the idea for Greyscale Goods was officially conceived when I was chatting with some friends about their recent shopping experience. One was thrilled with her latest experience with Stitch Fix, and couldn’t get enough. Her girlfriend, however, who dresses more androgynously, admitted that she would love to be able to have that shopping experience, but there wasn’t a company offering her style of clothing in the same platform. The brands exist in the market, but they are spread so far apart that finding them is often exhausting and time-consuming. With Greyscale Goods, we aim to target the market in between these two segments: the gender-neutral style. We will be covering the “grey area” between traditional men’s and women’s fashions. 3. What do you hope to change about the way the world views fashion, gender, personal style with Greyscale Goods? In practically every single clothing store in the US, there is a men’s department and a women’s department. Even if some of the clothing in either department appears somewhat androgynous, the fact that it is housed in one department versus the other sends the message that it is intended for a certain gender. The difference is usually in the way that the garments are cut to fit. But if a woman wants a shirt that is loose and comfortable that means that she has to shop in the men’s department? Why does a certain fit have to be tied to gender? Why can’t fit just be based on fit? On the greater timeline of clothing history, we live in a moment of such androgyny of dress that it feels almost antiquated that we have to still choose a side of the store to shop in. We also live in an amazing time in history that embraces the fact that gender is not polarized, but rather exists on a scale. For anyone who does not identify strongly within one gender, it can be incredibly awkward to have to “come out” every time they go shopping. Shopping for clothing should not have to be such an affronting experience. Clothing is a necessity and most of our society takes it for granted that they can just walk into one side of the store without thinking twice. Well I think it’s time for everyone to start thinking twice about polarizing clothing departments and why we still allow them to exist. 4. What are your long term goals for the company? What would be a dream to do with this if you could take it as far as you wanted? I’m afraid to put it out there yet! I have some ideas brewing and I think that customers would be super stoked to hear them, but I really want to get the basics going first before I start revealing my future plans. As of now, I will be so excited to see Greyscale Goods become functioning to serve customers by sending boxes of styled looks according to their individual style profiles. 5. Who are some of your personal style heroes (models, actors, designers) and what do you love about their clothes? and Jenna Lyons. Each has such a strong point of view and conviction in their style and message. I love conviction. I believe in sticking to what you believe in! For Greyscale Goods, my inspiration mixes in Ellen De Generes (a major style icon for this genre) with Ellen Page, David Beckham, Usher and Justin Timberlake, alongside who I mentioned previously. 6. Will there be options in there for "grey area" lesbians like me who aren't as masculine as the bois and more androgynous/dapper types but definitely still want some button ups, tanks, and jeans with a slightly more femme flair? YES! I consider my coverage to range from 1 to 7 on the scale of style where traditionally masculine style is a “1” and traditionally feminine style is a “10”. While I don’t plan on offering skirts or dresses, I definitely plan to offer items that would be considered “tomboy femme”. A lot of times style is about how you wear a certain item: I could borrow an oversized button-down out of my girlfriend’s closet and it would still end up looking more “femme” because of the accessories I wear with it. When I send items of clothing, I am taking into consideration what your personal style is, so if I send you a button-down shirt, I will offer styling recommendations that will be unique to your style! 7. Anything else we need to know about this awesome new startup? We just got fully funded on Kickstarter and are so excited. The campaign ends Oct. 31 at 11:59pm so go check it out if you still haven't seen it. We have so many more exciting plans in the works for the future, so please keep watching our progression!